Braemar is a well known name in the world of ambulatory cardiac monitoring. Braemar has made Holter Monitoring devices, Cardiac Event Monitoring devices and now Mobile Cardiac Telemetry devices for leading cardiac monitoring companies. Braemar continues to provide reliable ambulatory cardiac monitoring devices as the premier OEM company. Braemar is now owned by the industry leader in Mobile Cardiac Outpatient Telemetry technology – CardioNet. 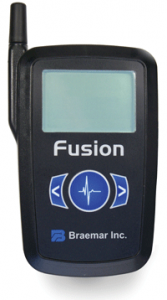 The Braemar Fusion Mobile Cardiac Telemetry (MCT) monitor is similar in function to other MCT devices in that it automatically captures & transmits patient ECG information in real-time for a period of up to 30 days. The Fusion MCT Monitor from Braemar provides the clinician with a unique ability to extract ECG information from any time during of the study. This can include other relevant arrhythmic information that may be deemed relevant for review by the referring physician. Integration with 24/7/365 diagnostic monitoring center for analysis.